That's how it was for me when introducing probiotics while on the GAPS diet! Probiotics — an essential part of the gut-healing GAPS diet — are how we repopulate our guts with all of the good stuff we've been missing. However, as we introduce them, our bodies can experience difficulty. This is why it's important to begin eating probiotic foods or supplements slowly. It took some painful lessons on my part to realize that this healing journey is a marathon — not a sprint. I hope my story helps you avoid making the same mistakes I did! Dr. Natasha Campbell-McBride recommends getting to a therapeutic dose of probiotics (15 to 20 billion bacterial cells/day for an adult) and then holding there for about 6 months. With this in mind, I slowly started adding a probiotic supplement after a first round of the Intro diet. I started with 1/4 capsule and increased up to 2 capsules per day without too much of an issue. After that, I forgot about continuing to increase the amount I was taking. A few months later, it dawned on me that I should have been increasing this whole time. I realized I needed to make up for lost time, and I was determined to do it quickly! Within a few weeks I was up to 3-1/2 capsules per day. This wouldn't have been so bad — if my body wasn't sensitive to increases, and I hadn't been increasing my probiotic foods at the same time. Yes, there are probiotics in food too! It may seem obvious, and I knew this at this time, but I still didn't think about how increasing both my probiotic supplementation and food intake would cause such strong die-off reactions. Take kefir, for instance. Kefir is highly detoxifying, especially if you let your rapidly growing kefir grains stay in your milk. Ask me how I know! I had never made kefir before starting GAPS and didn’t know that I should get rid of my extra kefir grains. I just let them keep growing and growing, which made the kefir even stronger, which caused even more die-off symptoms. Gradually, throughout the month or so that I was increasing my probiotic supplements while also consuming my super strong kefir, I felt worse and worse. I got severe headaches every day, dealt with extreme exhaustion, and had a spreading rash. …And then I connected the dots, and realized that I needed to slow it way down. 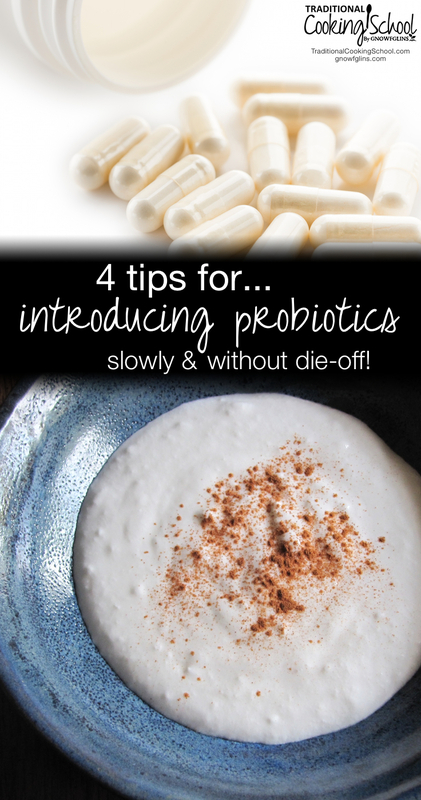 After my own experiences, I put together these 4 tips for introducing probiotics slowly, so hopefully, you will experience little or no die-off. Yes, it's tempting to hurry up the process. For me, 1/4 capsule increase per week is very manageable. If you aren't as sensitive, perhaps you'll be able to increase by 1/2 capsule at a time — or more. Look for signals that you're going too quickly. Do you have headaches, rashes, or exhaustion? Whatever signs you experience will be unique to your own body. If you notice anything out of the ordinary, slow down a bit. If you're eating foods like sauerkraut, kefir, and yogurt, make sure you're not increasing those amounts too quickly if you're also increasing your supplement at the same time. My body responded better if I didn't continually increase. If you're now at 1 capsule per day, take a few days to a week before starting to work up to 2 capsules per day. Have you dealt with die-off from introducing probiotics too quickly? We only use probiotics to help stabilize upset G.I. symptoms, as a replacement for pepto. If someone gets an upset stomach, one pill a day for two to three days usually controls symptoms and clears everything up. Usually use full strength Culturelle, even for the kids. We found that the children’s strength was ineffective and after consulting with the doctor we switched to the adult strength and they respond well to that dose with no side effects. Thanks for the tip about using probiotics for upset G.I. symptoms! of course you need probiotics to get better. I suggest to take chorella with the probitics, since chlorella detoxifies. And for those who used lots of antibiotics I also recommend to read http://drbganimalpharm.blogspot.com and http://freetheanimal.com/2014/05/resistant-problems-ignorance.html where you can find amazing information about what soil-based probiotics can do for a body. The second link is to a story where a person with chronic salmonella tried to resolve it with antibiotics – which did not work – and then took soil-based probiotics. After 10 weeks the salmonella was gone, and as a “side-effect”, also the gluten intolerance and high blood sugar were gone. What do you mean die-off symptoms when you describe the strong kefir? Die-off symptoms are when the body is strongly reacting to all of the good probiotics eliminating the bad bacteria in your gut. I had severe headaches most days, extreme exhaustion, and a rash that was spreading all over my body. I think it took place because of the combination of my very strong kefir while also increasing my probiotic supplements. You say you started adding probiotic supplements after a first round of the intro diet. I thought probiotics are started right from the beginning of gaps. Are you supposed to wait or something? Loren, I’m not completely sure whether they’re supposed to be started right away or not. I chose to not take any supplements at all when first starting GAPS intro so that I had as little possibilities for die-off as possible. Once I was done with intro, then I started adding them in. Now when I did intro a second time this past spring, I just stayed at my current level of probiotics and waited until I finished intro the second time to begin increasing again. I made the mistake of forgetting to stop my probiotics during the Intro diet (I believe they are re-introduced slowly in stage 3 or 4? can’t remember). I’m convinced that’s what caused my “GAPS flu,” where I had chills, fever, nausea, and a horrible headache for about 48 hours about 2 days into the Intro diet. It was awful! I had been using Garden of Life Primal Defense Ultra, but then read conflicting info on whether the HSO (soil organisms) that Dr. C-M recommends are good for you, or horrible for you! I panicked, and stopped taking them altogether. Have you done any research on the pos/neg of HSOs? I haven’t looked into the HSO and conflicting info at all. I’ve just been sticking with the Bio-Kult brand that she recommends. It would be interesting to find out more about what’s been said in relation to HSOs. I have tried both the Primal Defense Ultra and the Bio-kult. My experience on the Bio-Kult has been easy, smooth and soothing. I was on Primal Defense Ultra for six weeks. I experienced die-off that never really subsided. It was not a comfortable experience. My sense is that is is not the right probiotic for me and my system. When I went back onto the Biol-Kult after being on the PD Ultra, it was a relief. My emotional peace returned. That sounds more like Atkins flu. If you weren’t eating carbs like you were supposed to your body was just switching to far burning. We have tried them, and like the previous commenter, are great for urgent needs. We otherwise use fermented veges, no whey added, for daily use. Adding whey just makes for a lactose (read dairy) fermented food, and they have a very minimal affect on the gut. Are you suggesting that because of the whey included in fermented veggies, the veggies are not as effective as a probiotic? Actually, Dr. Natasha Campbell-McBride recommends adding whey as an option for fermented veggies (see p. 197 in Gut & Psychology Syndrome). Now if you have a sensitivity to whey, you’re not going to want to add that in. I’ve found that even with my dairy issues, I was able to add in whey fairly early on. I also like to add it to slightly cooled soups for additional probiotics. I use my homemade raw kefir internally (protien shakes, ice cream…)and externally (cuts, inflamation, soars, open wounds…). I give 2 tablespoons to each of my dogs daily and they LOVE it! I never thought of using externally, but what a great idea! It makes sense that it would help our bodies heal on the outside too. My daughter started some probiotics due to her stomach not feeling well after she was sick a little while back. After a few days she started to break out in a rash on her stomach and on her hand. I thought it may be related, and after reading your experience I think she took too many to quick. I was wondering how fast the rash went away for you and if there was anything that helped it. I am not big on prescription meds so I have been trying to take care of it at home instead of taking her to the Drs. I bet you’re right, Angela. My rash took a few weeks to go away completely. However, it had been there for several weeks before I figured out what was happening. I took a break from kefir, and decreased the amount of probiotics I was taking. I also tried to do detox baths fairly regularly. It was much better, but not completely gone About a month later, I did intro again and that is finally what cleared it completely. Has she had it for very long? I think my comment was not all that clear. Dairy ferments are very good, but inoculating veges with lactose, allows the basics of the dairy to take over, but there is much lost in translation, so to speak. How do you know when you have reached a therapeutic dose? Mel, it’s when you reach 15-20 bacterial cells per day for an adult. The number of capsules will depend on the brand you’re using and how many bacterial cells are in each capsule. If you’re using Bio-Kult, that should be 8-10 capsules per day. After working my GAPS practitioner, Monica Corrado, we’ve decided my goal is to get to 6 per day since I seem to react so strongly to them. Once I hit that, I will hold it for approximately 6 months before slowly decreasing to a maintenance dose. Do you take all 6 at once or spread them out during the day? As I increase to the therapeutic dose I’m trying to find info about how to spread it out or if I should take all at once? My son is on antibiotics long term for acne. I am concerned about this. I had a chiropractor once that says it doesn’t do any good to be on probiotics until after a person is off of the meds. Is this true? Hi, My son had a raging case of acne and now it’s almost gone! He’s been taking Pantothen for a month and it dissolves oil before it gets to your skin. It’s an over-the-ounter supplement. He has one shrinking zit left and some fading red blotches. These blotches can take up to 2 months to fade away. So I’m thinking he’ll be acne-free with no sign of redness within the next month. I ordered a three month supply with no shipping and a coupon it came to $60. Well worth it! Google Pantothen if you are interested! I would think it would still be beneficial to at least include lots of probiotic foods while he’s on the antibiotics. Whether it’s worth paying for probiotics, your chiropractor may be right. I’m not really completely clear on that point. I’d also recommend looking into natural ways to heal acne rather than with antibiotics. I think being on so many antibiotics as a child, both for sickness and then as a teen for acne, contributed to a lot of my gut issues that I’m working to heal now. I hope you’re able to figure out a good solution, Fay! Thanks for the die-off warning. I gave my 3 year old son Soil Based (SBO) probiotics for the last 3-4 weeks hoping to resolve his IBS symptom and behavioral issues due to bad bacteria and candida. I started on 1 capsule per day, he practically acted as if he had alcohol and were very active. Needless to say, I was so scared to see the reactions from SBO. I backed down the dose to only 1/2 capsule per day for a few weeks but his bowel movement has been loose and runny. I’ve been maintaining 1/2 capsule for a while and am afraid to increase his dose. How do you know when you are ready to increase the dose? should I maintain at 1/2 capsule until his loose/diarrhea stop or continue to increase after a period of time? Have you ever heard of SBO probiotics by Bodybiotics? Both my son and I are extremely sensitive to this probiotics. Not sure if it means that the probiotics are actually working or that I am not tolerating the probiotics. For me I developed depression, brain fog, and extreme fatigue while on the Bodybiotics SBO. I ended up stopping the probiotics all together due to my sensitivity to SBO. It’s amazing how quickly we can react to probiotics! It can be hard to know when it’s time to move on with the probiotics. For me, I’ve found it’s better for me to wait until my die-off symptoms have gone away before increasing again. That’s a hard one as far as knowing when to increase with your son. My guess (and I’m not a doctor!) would be to hold off until his die-off symptoms have disappeared. When I tried to push through my symptoms at first, they ened up much worse. I found that increasing by a 1/4 capsule was the best for me. I haven’t heard of those probiotics. Have you tried any others and still have the same reactions? I’ve only used Bio-Kult so far. I have similar die-off reactions if I increase my probiotic foods too quickly. I have found that using an ionic detox footbath in conjunction with the right probiotics (SYNTOL) helps enormously to rid the body of toxic die off which is the reason for brain fog. SYNTOL have ingredients ,digestive enzymes , vitamin C and prebiotics to help rid the body of toxins from die off.It is counter productive to not use methods cleanse the body of toxins from die off while on a probiotic supplements and diet program.There are many probiotics and some (most) blends are ineffective for candida sufferers.Only specific probiotic strains work against candida. You need to drop all sources of sugar from your diet. This includes all fruit. Also no foods with vinegar and yeast extracts.Note that even veggies like potatoes and carrots have significant sugar content.With the ionic detox footbath take 10 sessions of 30 minutes in 20 days.Then take a break. You will see the dead candida floating in the footbath as well as a yellow- orange colour which is cellular debris.You should take a broad range multi vitamin tablet with significant levels of for each appropriate vitamins and minerals. Hope this helps. Candida disease is very debilitating and can ruin someone’s life for decades if not diagnosed and treated. Unfortunately the mainstream medical profession is generally ignorant, missing the connection between yeast disease and leaky gut syndrome, dysbiosis, fibromyalgia,hemorrhoids, diverticulitus, and many other side effects as a result of candida disease. what should i do if I am lactose intolerant? Also, if I use a wholefood processor like Blentec should I still cut back on vegatables as suggested in the GAPS program? I started making non-dairy kefir and didn’t know how powerful it was. I was pouring it on food etc, probably 1/2 cup a day. Terrible headache, rash, arthritis etc. Researched and found it was the kefir so I backed off to 1 tsp day, then 1tsp every other day. But then I started adding sauerkraut, ha, thinking it would be okay being different probiotics…terrible headache, arthritis again. I think I am going to stay off the kefir. My daughter and husband have a shot glass a day without problem. Wow, I had no idea probiotics could have a negative impact like that. I have been trying to figure out why Malachi is having such a hard time. I chalked it up to teething (which I’m sure is not helping). Now I know it could be the probiotics! Thank you for posting all this great info you find. I think that you guys with all the reactions to probiotics need to consume a high quality aloe vera product and/or Manuka Honey. Both will give you much healing relief. The aloe is cheaper than the Manuka but Manuka has standards and there are no standards in the aloe industry and it’s a crap shoot. Verapol® I know is good and George’s Aloe has a good reputation. I am so happy I’ve read this. I have been feeling like I have one to many ailments of late and a few years back I went to a nutritionist who took me off of lots of different foods and then put me on pre and pro biotics. As this helped me significantly back then, I thought I would try to go on probiotics again with a less extreme diet. However, I’ve overdone it. I started on 20,000 particles a day (1 in the morning and 1 in the evening). I thought that die off was normal and that getting headaches, sore throats, aches and pains as a result of it was normal, but apparently, according to what some of you have written, this is not necessary. If I start in small doses and work my way up, I won’t feel unwell from it. So my question now is – should I come off of them completely, wait until I feel well again and then start on 5000 and work my way up? Any advice would be appreciated. Over three years now I’ve been slowly increasing – not consciously just kind of following my taste buds – intake of pro. B. Now one any given day I eat a half a litre of milk kefir and a handful or two of sourkraut. My appetite has over that period dropped dramatically – presumably as my body could better assimilate foods – and so did my waist – there doesn’t seem to be much at all sitting in my digestion tract. My skin cleared up dramatically. And I’ve lost all taste for sugar and very sweet fruits. NOT if you have SIBO!! If you have SIBO steer clear!! I experienced some nausea when I started Prescript Assist probiotic/prebiotic after being on IV antibiotics for two days. It went away within a couple days and I was fine after that. My son, on the other hand, had some heavy duty probiotics his brothers were taking for gut healing and he was violently ill. It didn’t strike me as die-off at all. He also eats and drinks enough probiotics regularly that die-off would be somewhat surprising to me. I suspect he had some other sort of reaction to some ingredient in the probiotics. He had less than his younger siblings usually get. How do these tips apply to someone with Ulcerative colitis? I take the raw garden of life probiotics that are 100 billion with 34 different strains. I notice when I take breaks I have flare ups. I can’t get enough of them ! Does anyone use vsl#3 ? Thank you so much for this–may just explain the nasty bag of symptoms I have been experiencing lately!!! On Stage 2 of intro I started getting palpitations and realised it was my 3 tsp of sauerkraut juice doing it and reduced to 1 tsp split over 2 meals. This week I added in yoghurt and sour cream and a little more sauerkraut cabbage and within 2 hours my heart was missing beats every few seconds. Four hours later it calmed down as fast as it came – even went to docs for ECG, but said all was fine. I was wondering when you slowly increase probiotics do you open the capsule up and mix a little with water. I just bought a probiotic and find it hives me brutal cramps trapped gas/bloat from die off symtoms so i want to slowly increase it.